MABRY: Good morning. Welcome to today’s Council on Foreign Relations meeting with U.S. Senator Chris Murphy. I am Marcus Mabry the senior director of mobile news programming at CNN. I will be presiding over today’s discussion. Today’s meeting is on the record. And we’ll start with my introduction to the senator, and then the senator will come up and make some prepared remarks. Then we’ll briefly chat, the two of us, and then we’ll open it up to the members for your questions and answers. Chris Murphy, the junior United States senator for Connecticut, is one of the Senate’s leading voices on foreign policy and national security. As a member of the Foreign Relations Committee, he has been an outspoken proponent of the need for clear-eyed American leadership abroad. He serves as a ranking member of the Subcommittee on Near East, South Asia, Central Asia, and Counterterrorism, and is an advocate for a strong transatlantic relationship as a member of the subcommittee on Europe and regional security. Senator Murphy recently laid out a forward-thinking foreign policy vision for the United States, including specific proposals to revitalize America’s smart power capabilities, in a blueprint titled Rethinking the Battlefield. The senator also serves on the Health, Education, Labor and Pension Committees. 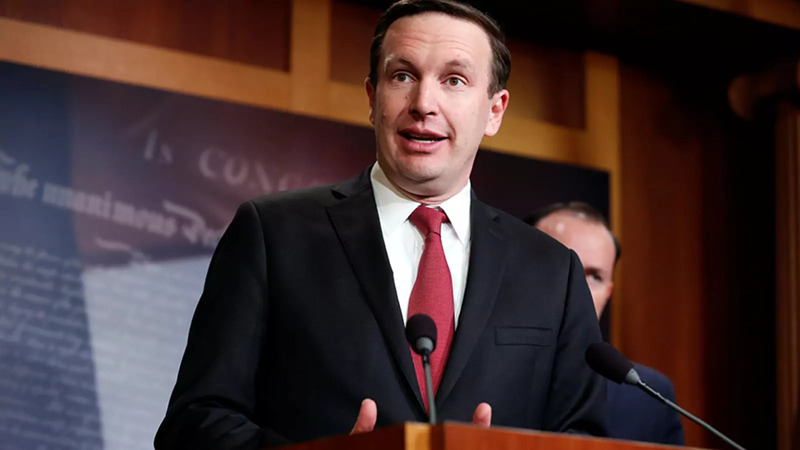 And following the tragic shooting at Sandy Hook, you may have seen recently more tragedy with regards to Sandy Hook, in 2012 Senator Murphy became one of the leading proponents of common-sense reforms to reduce gun violence. He has championed a number of bipartisan bills aimed at expanding background checks and keeping guns out of the hands of criminals. And I’ll stop there. You can read the rest of the bio yourself. MURPHY: Well, thank you, very, very Marcus. Thank you to the Council for having me back. Thank you to all of you for coming out this morning. And I’m looking forward to a discussion, to taking as many questions as we can in the short period of time that we have. I wanted to talk to you a little bit this morning about Europe. I want to talk to you about the transatlantic alliance, especially important given that we’ve got a very important week this week with NATO in town in Washington, D.C.
I’m listening right now to a very long, fifty-episode podcast of the French Revolution, in part because there’s very little that can make me optimistic about politics in America right now, except to be thinking about the French Revolution. And one of the minor subplots of the French Revolution that has fascinated me as I’ve been listening to this is one high-level position in the French government during this period of time that became, over time, impossible to fill. In the early days of the French revolutionary government’s war with the allied powers, military defeat on the front was quickly followed by execution of the commanding general in the field. This became a regular occurrence. And so as soon as you met military defeat on the front, you were summoned back to Paris and you were very quickly tried and executed. And it became very, very hard to find anyone who would do that job. And it got me thinking that during this time, where the revolution was shattering French social, political, cultural norms, left and right, the one habit that was too hard to break was this allure of nationalist military glory. The convention and the committee on public safety, they wanted it so badly. They wanted it just as badly as the long line of French monarchs, who relentlessly pressed their grievances through war with other European powers, century after century. Everything was changing in France during this period of time, virtually overnight. But there was one thing that didn’t change, the idea that a nation or a race of people wasn’t truly successful without military glory over others. And so I want to fast-forward then to a trip that I took to the periphery of the European Union just a few years ago. In 2014, I was in Serbia and Albania. And the day that I arrived, something really interesting happened. There was a soccer match between Albania and Serbia in Belgrade. And an Albanian-piloted drone dropped a flag depicting a map of greater Albania onto the soccer pitch. Now, nothing gets blood boiling in the Balkans faster than threats of carving out pieces of countries, like Serbia, to create a new Albanian state. And predictably, the recriminations began immediately, while I was on the ground there. Edi Rama, the Albanian prime minister, cancelled his planned history-making visit to Belgrade, in part because the Serbian authorities began to circulate these wild versions that I was Rama’s brother—the prime minister’s brother—that had piloted the drone into the stadium. A social media war of words erupted between the two countries’ leaders. Rama tweeted: A normal Serbia might be possible if only the real Serbia will understand that greater Albania is their nightmare, not our project. Alexander Vucic, the young prime minister of Serbia fired back. I got the chance to see Vucic the next day. And I reminded him of the dangers of escalating rhetoric between Balkan nations and how badly this could go really quickly. But even though he had been a little tough on Twitter the day before, he didn’t need convincing because his primary focus—unlike leaders for decades and centuries in the Balkans—wasn’t on besting regional rivals. His focus was on Europe, and in particular joining the European Union. He saw it as the golden ticket for his country’s people. And it was the economic and political model there in Europe, formed with the help of the United States, that was so attractive to his nation and so many other nations who for centuries had been reflexively at war with each other, but now were willing to put it all aside for a chance of becoming part of the European club. Now, Rama had the same dream for his country in Albania. And so they set aside their differences quickly. Rama rescheduled his historic trip to Serbia. And when they appeared together in an Albanian section of southern Serbia Rama said to the press that he does not dream of greater Albania, he dreams of great Europe. And so it is miraculous how in a relatively short span of time, given the millennia that Europe had been at war with each other, how things have changed. And just because Europe has been at peace for seventy years doesn’t mean that that’s how it’s going to stay. History tells us that the new order and the new rules are always overtaken by a newer order and updated rules. It takes hard work to preserve the status quo. And so that’s why I’m here with you today. I just came back from a trip to London, Dublin, and Belfast. And the precedent right now being set by the departure of Britain from the European Union, and the way that our government is cheerleading and incentivizing it, threatens to pull down the entire post-World War II multilateral structure that has provided peace in Europe for so long and has created this entirely different incentive structure that is foreign to anyone that has studied the long past of that continent. So first I want to just back up and talk a little bit about this assault that has been launched by the Trump administration against multilateralism in general, but Europe specifically. Last December, many of you might have seen, but maybe didn’t see, this remarkable speech that Secretary of State Pompeo gave to a crowd in Brussels about, quote, “restoring the role of the nation-state,” in which he excoriated our allies and multilateralism in general. He went after the EU, the U.N., the World Bank, the WTO, the International Criminal Court, the Organization for American States—pretty much every institution through which the United States has exercised global influence. And it left a lot of us scratching our heads about what he actually hoped to accomplish with this diatribe. It wasn’t going to make NATO members more likely to increase their defense budgets, or Europe to be more flexible in trade negotiations with us. But it was a fairly honest expression of this administration’s approach to traditional alliances. Now, the list of specific attacks on Europe have been dizzying. Rather than work together with the EU to present a united front about trade concerns with China, the president imposed steel and aluminum tariffs on the EU, justifying that decision by asserting that exports by our closest allies were a national security threat. The United States has withdrawn from the Paris climate accords, the Iran nuclear agreement, the INF Treaty, and the Trans-Pacific Partnership. We fail to show up now at the international conferences that we used to lead, sending low-level representatives to Europe, or sometimes nobody at all. And the president’s routine bashing of NATO, the organization that will meet this week in Washington, has led Republican voters’ support for NATO in this country to dangerously drop below 50 percent. And who knows what Article 5 actually stands for any longer, whether it’s a collective defense provision or whether it’s now an optional mandate. And then there are just these sort of daily ways that the administration goes out of its way to insult or demean the European Union, like downgrading the status of the EU embassy in Washington, forcing the EU ambassador to literally go to the back of the line in meetings, or be excluded from them altogether. And that’s after the president called the EU a foe of the United States. Now, Wess Mitchell, who I think has been an exceptional assistant secretary of state, is one of the few officials who’s been working to maintain these important relationships. But he resigned in January, reportedly because he no longer feels that he can be effective against the onslaught from the rest of the administration. Now, I can’t speak for my friend Wess about what he saw inside the administration, but maybe he was just as concerned with what was happening outside the White House. Because the president’s political team has been hard at work building up the power of the anti-EU, nationalist, xenophobic far-right in places throughout Europe—like France, Italy and Hungary. And this is, frankly, just as important as the official actions are because a recent report by Open Democracy revealed that Christian fundamentalist groups with links to Trump and to Steve Bannon have poured millions of dollars into Europe to lobby members of Parliament, fund medic campaigns, and challenge laws against discrimination and hate speech in Europe courts. Donald Trump’s personal lawyer is the chief counsel for one of these organizations. Now, as Pompeo and Bannon have both articulated, the principle of sovereignty is at the heart of this movement—as Bannon talked about in his Brussels speech. And the enemy, of course, of sovereignty is multilateralism, the idea of giving up some degree of autonomy to cooperate with other nations for mutual benefit. And we shouldn’t just assume that because multilateralism is a good idea, because we all see the fallacy in these nationalist movements throughout Europe, that multilateralism can ultimately withstand attacks from these domestic movements supported by the president and the president’s political machine. And of course, the other key member of this coalition is Russia. Now, once we get our hands on the Mueller report we’ll have a better sense of how close the president’s political team’s connections are with those that revolve around the Kremlin. But we already know that Trump’s assault on Europe basically does Putin’s dirty work for him. And the millions, maybe billions, of dollars that Russia is putting into weakening the EU and NATO, they just layer on top of the work that the administration is doing with these homemade anti-EU groups. So what should we do? And maybe more specifically, what should we do in Congress, because you know that there is both Republicans and Democrats who are increasingly uncomfortable with these coordinated attacks against Europe. And so I want to just finish by laying out a short-term plan and a long-term plan to try to breathe some new life into the post-war political order, and how Congress can show some leadership here. The short-term plan revolves around how American reacts to Brexit. And having just come back from the middle of it, I’d love to share a few quick thoughts. President Trump welcomed the result of the Brexit referendum on Britain leaving the EU. And he’s been obviously very sympathetic to British Brexiteers who have promised this return to Britain’s glory days once they shed the bureaucratic constraints of the European Union. The reality of Brexit, of course, is turning out to be totally different. The economy could shrink by 7 to 10 percent, unemployment could rise, and Britain’s going to have to pay the EU to leave not the other way around. Nevertheless, the administration, as—while I was there in Europe they were doing this last week—are urging Britain to exit the EU as quickly as possible. And they are now dangling the possibility of a quick U.S.-U.K. free trade agreement to make up for any losses that Britain will experience from leaving. Now, that’s the equivalent of pushing Britain out the door, and incentivizing others to do the same. And that’s why it’s a bad idea, notwithstanding our special relationship with Britain. And so the United States Congress should make it clear that the U.S. will not do a trade deal with Britain until two things happen. First, no U.S.-Britain FTA until the United States does a trade deal with Europe first, or at least we give that FTA a serious try. It won’t be easy. This is a moment where we should loudly, clearly declare our preference for an economic relationship with the European Union over any bilateral economic relationship—even with our most important partner, the United Kingdom. Second, no trade deal with Britain unless the Good Friday Agreement is protected through the Brexit process. A messy exit from Europe would mean that a border would need to be reestablished between Northern Ireland and the Republic of Ireland. And given the existing brittle state of the peace process there—as you know, there hasn’t been a coalition government between Unionist and Republicans for about two years—the Irish island can’t afford to have a hard border, which would be a target for sectarian attacks. The United States Congress should make this clear: A trade deal with Europe first and protect the Good Friday Agreement. That would be an effective short-term plan to protect America’s equities involved in Brexit and counteract Trump’s anti-EU crusade. But in long run, we’ve got to rebuild our partnerships with Europe, because the current basis of the partnership, it is antiquated. It is outdated. And it, frankly, does give foundation for many transatlantic haters to ask why we’re still in business together. So the alliance does need these new capacities and these new tools. And let me just give you—finally finish with a couple of these examples. The EU fumbles often when it tries to tell its members from where and from what countries they should get their energy. That’s because the EU has few actual options to help its members become energy independent from energy that originates outside the EU—like, of course, in Russia. The United States could help, but today we don’t have the ability to do that. I think the United States should stand up a $1 billion energy independence bank to finance projects in Europe and throughout Russia’s periphery. That would be bad news for Moscow, who currently, frankly, loves the fact that the United States is spending $4 billion in new military deployments along the EU-Russia border, but no money to actually try to break the critical energy ties that connect Russia and Europe. Second, we should lead a transatlantic initiative to expose and counter state-sponsored propaganda and disinformation that is aimed at distorting both American and European democracies. Now, I introduced legislation that passed with Senator Rob Portman of Ohio to authorized what’s called the global engagement center, which is a State Department office that is using resources from both State and DOD to counter this kind of propaganda. It was like pulling teeth to get the Trump administration to take the money and set up the new office. But it is up and running. Democracies cannot survive, they’re being constantly undermined by outside propagandists. And the United States should be helping Europe root out the actual fake news from the real stuff. Third and finally, we need to stop complaining about how much influence China and Chinese technology have in Europe and start doing something about it. The U.S.-EU trade agreement is absolutely critical. Without it, we have no hope of keeping China and the Chinese financial interests and product standards out of both Europe and the United States. But as China tries to own the business of deploying 5G throughout Europe, the United States needs to be a position to offer real, meaningful technological expertise to European governments as they stand on the precipice of turning over to China their high-speed data systems, which we believe would be a national security disaster for both Europe and us. But today, the State Department basically outsources cybersecurity to the Department of Defense, which simply isn’t in a position to do complicated country-by-country diplomacy on this issue. The people in the State Department who work on technology also have in their portfolio energy, and health, and a whole bunch of other things that keep them busy. Now, I saw the growing influence of China on the last stop on my trip. I was in Dublin. And we heard reports while we were there that I had heard ahead of time, that the Chinese embassy in Dublin is growing daily by leaps and bounds. It’s so much bigger today than it was just a couple years ago. Dublin is overflowing with Chinese diplomats. And many of them are focused exclusively on technology. Now, this is no coincidence. Dublin is busting with American and global technology companies. Lots of U.S. data resides right now in Ireland. And, not coincidentally, the country is poised to award a new contract for the buildout of their 5G network. The Chinese are on the march in Dublin. They are pushing Huawei relentlessly. And what are we doing? We’re telling Britain to leave the EU more quickly, risking a political cataclysm in Ireland. We are making it more difficult politically for the Irish, while the Chinese are offering them a solution. So it’s no surprise at the end of 2018 that a Gallup poll showed higher global approval for Chinese leadership than leadership by the United States. Now, maybe China isn’t more popular in Europe right now, but just wait. Unless we understand that simply waiting until the Trump administration is gone is not enough when it comes to rebuilding our partnership with Europe. We have to manage our way through Brexit, but we also need to refresh that partnership. And there’s no better moment than the 2020 presidential election to start planning for this transatlantic rebuild. So for those that are running to become commander in chief, it’s not enough to just complain that Trump has undercut our European allies. Let’s start seeing plans on how to fix and rebuild this alliance, and how to put the United States back in a position that it held during the heady days of the Marshall Plan, when nobody cared more about the survival of Europe outside Europe than the United States did. MABRY: Thank you for those thoughtful remarks, Senator. It’s a pleasure to be joining you here so early in the morning. I got a little nervous when you started talking about 2020. I thought you were going to be yet another Democrat to announce. MURPHY: (Laughs.) I’m out. I’m out. Somebody’s got to stay behind and run the Senate, you know? MABRY: (Laughs.) We have—at CNN, we’re spending a lot of time covering the Democratic candidates. MABRY: (Laughs.) We have a lot we can talk about this morning, and I hope the membership will take the conversation in the direction it pleases. I’m going to start with what I do think, as a father of two nine-year-olds, is the most important question. Which is: You talked about the far-right groups that the administration is egging on. And I think of a few ambassadors in Europe in particular of the administration. What is their goal? What is the administration’s goal in doing this? MURPHY: This administration has made clear from the beginning that they see weakness in cooperation outside one’s borders. And it fits, you know, very neatly into their domestic agenda around trying to make people fearful of others, people that, you know, don’t look like you or don’t speak the language of you, or worship the same way that you do. And so their sovereignty agenda internationally is just an extension of their desire to try to make this country look inward, and to victimize new entrants to the country. You know, I don’t know that the president himself gives an enormous amount of thought to this broader international movement, but he certainly has people who trade on his name, like Steve Bannon, who have spent their careers thinking about how to blow up these bigger, larger international institutions. And, you know, this—his ascendancy to the White House, and the power that he lends to Bannon and his ilk who are traveling the world right now, comes at a time at which, you know, there was already an attractiveness in pulling inward. The same things that led to the president’s election here led to the successful referendum in Europe. There is just a general hesitancy globally to invest in governments that are far away from you as the inputs that are coming into people’s lives are becoming so dizzying and so hard to sort out. People just want their government to be closer. That makes them feel comfortable and better about a world that’s harder to parse. So, you know, all of this—you know, this is sort of a—you know, unfortunately a, you know, perfect storm of events. But, again, my point is that it’s not enough to just think that, you know, the transatlantic alliance sort of just resets after the Trump administration, that these nationalist movements go away the minute that Steve Bannon is not as powerful as he is today. You’ve actually got to provide some new capacities to deal with some of the challenges that Europe faces that can’t be dealt with currently inside of NATO or some of our other international forms. MABRY: So there are—and we’ll talk about some of the policies you already laid out, right, of ways to do that from a policy point of view. Is there—is there a people plan? As an establishment politician, is there—is there something to do to diffuse the underlying feelings that you’re talking about here, that are not even about Bannon or Trump but exist kind of throughout the West, it seems, at this moment? MURPHY: No. And I—you know, I think from the beginning in the United States, you know, this is, I think, a byproduct—and this I’ll get too deep into domestic politics, so I won’t go too far—but this is a byproduct of an economy that has left millions and millions of Americans in a position of absolute destitution, or the verge of destitution. You’ve got 40 percent of Americans who couldn’t come up with $400 for a medical emergency without borrowing money or going into debt, right? That is a situation that lends itself to demagoguery and to scapegoating. But the situation is not terribly different in Europe either, right? We have economies on both sides of the Atlantic that have left millions of individuals on the precipice of real crisis. And that has given—you know, that has given purchase to these movements. And so the ultimate solution here is to build fairer economies that spread the benefits of what has increasingly become a winner-take-all society to more people. And I think as you—as you do that, you weaken the case for some of these people who are trying to pry upon individuals’ feelings of instability. So there are domestic roots at the—when it comes to the solution here. But you’ve got to manage it in the short term as a foreign relations problem as well. MABRY: So to return, then, to the foreign policy management of it, and tell us again about the anti-propaganda office that you successfully got in this environment where the Senate is controlled by Republicans? MURPHY: So, you know, I think we just generally have to understand that the tools Russia has, in particular, are not ones that can be met most often by brigades that are deployed to the front any longer. And we are right now just very badly resourced in general to fight the threats that are posed to America, but in particular posed to America and our allies by Russia, when we’re spending twenty times as much money on the Department of Defense and intelligence as we are on non-military tools. And so the Russians are every single day using propaganda, whether it be through the things you know about—like Sputnik which now, by the way, has one of the most powerful radio stations in Washington, D.C. broadcasting. They bought 105.5 in Washington, D.C.—or RTV, but also just through the outright purchase of all sorts of news outlets and media outlets throughout Europe. And we have really very limited means to confront that. BBG, the Broadcast Board of Governors, has, I think, done a decent job of modernizing. But they still have a fraction of the budget that the Kremlin does. So what we wanted to do, Senator Portman and I, is stand up an entity inside the State Department that could be a little bit more political, that can be a little bit more nimble than BBG can be, than the Broadcast Board of Governors can be. And that’s what the Global Engagement Center is. The Global Engagement Center as well is focused on actually reaching out and doing partnerships with journalists overseas, especially in places where objective journalism is new. The Global Engagement Center can go out and work with independent, objective journalists who are trying to root out propaganda or trying to tell domestic objective narratives. You know, it’s tough, because a lot of folks don’t want a grant with U.S., you know, branding on it. But there are a lot that do. And so we have just started to push that money out the door. And now we have real capacities on the ground in places like the Balkans to, you know, identify for individuals who’s funding the different narratives you’re seeing. If we could just do that, fund people who can at least identify what’s paid for by subscription and what’s paid for by the Kremlin, that would, I think, help us level the playing field. And that is finally being funded at about $60 million a year. I have some tough words in the speech for Mike Pompeo, but I will give him credit. Rex Tillerson wanted nothing to do with the Global Engagement Center, refused to accept the money from Congress to set this capacity up. Mike Pompeo has run with it, hired, I think, a very capable new head of the office, and I think understands what it can do for our security and European security. MABRY: What else can be done—for those who oppose the Trump administration’s foreign policies—what else can be done to counter it in the short term and in the long term? Because if the president’s reelected, you could be looking at eight years of Trump foreign policy. What are the ramifications for the U.S. and for the world in that world? And what do you do in the meantime? MURPHY: Listen, I think it’s hard. I mean, Congress is set up, you know, so that the checks and balances on domestic policy work pretty well. They just don’t work as well on foreign policy. So there are some—there are some offensive and defensive steps that we can take. So the Global Engagement Center’s a perfect example of an offensive step. We’re going to just recognize that there’s a capacity that we don’t have. We’re going to set up a new funding source, a new office. And we’re going to make the president take the money. The BUILD Act is another example of that, where Republicans and Democrats got together, said, you know, this alphabet of international financing agencies doesn’t really make sense, especially when the Chinese, you know, have this new global investment bank. We’re going to set up a new international finance authority, funded by U.S. dollars, bigger and badder than the one that we used to have. Did it, funded it. This billion-dollar energy independence fund that we’re proposing would supplement that. And then there are defensive steps you could take. So one of the things I hope we’ll talk about this week in Congress is legislation that would prohibit the president from withdrawing from NATO without a vote from Congress. That’s not traditionally how we deal with treaty withdrawals. We generally have given the president discretion on those, but these are exceptional times. And so it seems as if we maybe should require the president to come to us if he wants to break some of these alliances. MABRY: Any Republican support in the Senate? MURPHY: Republican support in the prior Congress for that proposal, and I think we’re sort of gauging how much Republican support there is in this Congress. So there’s some defensive steps that you can take. And I’m sure that proposal will be discussed this week while NATO is in town. MABRY: Privately do your Republican colleagues in the Senate talk to you about how they too hope to curtail, or frame, or modify the administration’s actions around the globe? MURPHY: I mean, they do. And there’s—you know, it’s an open secret that the president’s budget that he continues to submit with these draconian cuts to the State Department is always dead on arrival. And so, you know, we—Republicans have, you know, gladly joined with Democrats to at least stop some of the worst of the president’s cuts. And, you know, my Democratic friends back home in Connecticut are always asking me to, you know, explain what’s going on inside the heads of Republicans who aren’t more forcefully, rhetorically opposing this president. And I explain to them one of the reasons that Republicans are not—are not opposing the president publicly as much as you may like is because many of them believe that they are influencing him behind the scenes on matters of foreign policy. Whether that’s true or not, I don’t know. But many of them, you know, believe that they are doing it. And, you know, with the recent example of Marco Rubio in Venezuela, there’s evidence that that is in fact the case. So, you know, Republicans have taken steps with Republicans to pass some of this legislation, to stop some of the worst of the president’s cuts. And I think many of them sincerely are trying to help the president make a little bit more sense of his foreign policy. And they have been successful in getting some decent people to take jobs in this administration inside the State Department and the Department of Defense, that would maybe be hard to fill if they didn’t feel like they had some Republican backstops. MABRY: So, as you said, in you recently returned from the U.K. and Ireland. In theory, we’re eleven days away from Brexit, right? In theory. There are a number of votes again today, starting at 10:30 eastern time, happening in Parliament on different paths forward. This is a totally unfair question, but where do you—having been just there on the ground—where do you think we’ll end up? MURPHY: I mean, I came back thinking that May’s deal was going to pass, come hell or high water. And I believe that, in part because I spent some quiet time with Labour members who were, you know, no big fans of Jeremy Corbyn’s who, you know, made it pretty clear that faced with hard Brexit or May’s deal, that they would swallow May’s deal. Now, she has made it enormously difficult for them to take that step. The night that I as there was the night that she gave this speech. Literally momentum was moving her way, and then got up and gave this speech, you know, going after members of parliament for choosing politics over their constituents—something that, like, we do in Washington all the time, but apparently was done in bad taste on London. And so, you know, she’s—she can’t get out of her own way. But if you had to ask me to today, I’d say that, you know, somehow, some way she get it—she gets it through. That being said, all that does is keep London and Parliament and Europe obsessed with Brexit for another two to three years, because all the hard decisions are just put off by May’s agreement—in particular this existential conflict that exists in Brexit, right? She continues to promise that they are going to get out of Europe in significant and meaningful ways, and they are going to refuse to accept a border between Ireland and Northern Ireland. Those are mutually exclusive. You cannot get out of the customs union and the common market while maintaining the free flow of people and goods. And while the DUP says that it is possible, it is not. And you will then just have two years of arguing over how you preserve the Good Friday Agreement while you are exiting Britain. And at some point, they will realize that you cannot do both of those, and they will have to make a very hard choice. So it just postpones a lot of the toughest decisions. MURPHY: Well, that’s why I sort of—yeah, I mean, that’s why I wanted to end with what China is doing. And, you know, what China is doing in Dublin was absolutely fascinating. You know, they just see this opportunity, right? They see—they see Europe and Britain obsessed with themselves. They see America navel-gazing. They look at the buildup of American data on that continent and see an opportunity. So this Chinese 5G buildout in Europe is real. It gives them the ability to—you know, essentially to take or obtain our data, which is really concerning for national security purposes. And we’re totally absent from the playing field. Russia obviously takes advantage as well, but I don’t think as much as China does in the long run. And I mentioned it in my speech but, you know, again, it’s just a matter of capacities and capabilities. I mean, the fact that the Chinese have all of these technology experts running around Dublin and we’ve got, like, one person in the State Department, in the embassy there, who does energy, technology, and health. And we’ve got a defense attaché who is wonderful, but not an expert in technology, who’s trying to sort of manage the case with the Irish about the dangers of Huawei. It’s just we’re fighting this battle on the continent, on technology specifically, with one hand tied behind our back. And we don’t have to. MABRY: With members who may not be familiar with 5G, just briefly, thumbnail, what is it, why does it matter? MURPHY: Yeah. So, I think, this is the—this is the new high-speed data system that Europe is building out on a country-by-country basis. Huawei, which has a lot of the hardware already on the continent, is making a play to essentially build those systems out. There are other competitors. They are mainly not American competitors. They’re European competitors. But they don’t have the legacy investments that the Chinese companies do. And they can’t do it at the same cost. There’s a lot of intel that the United States is trying to share with our European friends about the integration between Huawei and the Chinese government. The worry is that this private company, once it gets its sort of full mitts into the high-speed data transfer business in the continent could ultimately be able to share some of that data one way or another with a Chinese company. MABRY: At this time, I would like to invite members to join the conversation with their questions. A reminder, this meeting is on the record. Wait for the microphone and speak directly into it. Please stand and state your name and affiliation. And please limit yourself to one question and keep it concise to allow as many members as possible to speak. Let’s go right in the middle to start. Yes, ma’am. Q: Thank you. Good morning. My name is Nina Schwalbe, and I’m a Council member. MABRY: The energy independence fund. MURPHY: Yeah, the energy independence fund. No, I mean—I mean periphery in a broader—in a broader sense. You know, we have had—the capacity to give Europe advice on how to build energy interconnections, reverse flows—for instance, you know, pure energy independence plays like gas terminals, renewable energy investments, nuclear upgrades. But we don’t actually have—we don’t have a meaningful capacity to help finance those energy independence investments. Europe has a $4 billion fund. That’s not peanuts, but what we’re proposing is to actually put American money on the table to help Europe, and then, yes, the Caucasus, Uzbekistan, sort of all the countries who right now don’t—have trouble finding the financing to build true energy independence. The just find it a lot easier to accept the cheap stuff from Russia. Give them the ability to access cheap American financing to underwrite those projects. I mean, listen, that still doesn’t solve the problem, because Russia is continuing to underwrite the investments they’re making. Nord Stream II which, you know, obviously is the big energy pipeline moving into Europe, makes no sense financially for Russia on its own. It only makes sense as a political project. And so I’m not suggesting that the United States would subsidize these projects yet with hard dollars—I can make an argument as to why that actually may make sense—but what I’m proposing now is to just put a billion dollars next to the EU’s $4 billion, you know, to increase by a factor of 25 percent how much financing is out there to allow countries to come up with their own projects for energy solutions other than Russia. MABRY: The administration might say that by pushing American energy dominance, and increasing its own exploitation, right, of its natural energy resources, that that is going to break already to break Russia’s stranglehold. Do you not buy that? MURPHY: Well, I do. And you’re already seeing an interest in American gas moving into Europe. The problem is it’s still a market, right? So the most likely customers for American gas, as we ship it around the world, are still in Asia, not in Europe. Again, commercially it still makes more sense for them to bring it in from Russia than to set up an offshore terminal bring it in from the United States. And it’s a—but, you know, we have this new bounty. I just would argue that we should tie it to some strategic decision making at the State Department and at our financing authorities, rather than just hope that it ends up in Europe. We should actually help them build the capacities to bring it in, in a way that we have not thus far. MABRY: All right. I’ll go right to the table here, gentleman. Q: Charles Henderson. I’m an attorney. Going back to the energy question, would that be government money—U.S. government money? And why wouldn’t that be a job for the private sector to get involved and provide the funding? MURPHY: So what we’re proposing—and, by the way, this—so this is a proposal that is moving very fast in Congress right now. This would be a billion-dollar financing arm that sort of sits in what used to be OPIC, right, that, frankly, you know, does business through the private sector, right? OPIC is, you know, often doing guarantees, not direct lending. And so it’s a mechanism by which to partner with American financial institutions. But that billion-dollar financing capacity could, you know, essentially be used to guarantee or underwrite private investments that are made. So it’s absolutely an opportunity for public-private partnerships. But, as I mentioned for folks that want to talk more about this, now is the time because this proposal, which we introduced a month ago, has already passed the House of Representatives. So it passed the Foreign Affairs Committee in the House two weeks ago. It passed the House of Representatives last week. It’s moving fast, we hope, through the Senate as well. We could have a billion-dollar energy independence financing arm of the new international finance authority, you know, within like thirty to sixty day, which is really exciting. Which is an example of how Congress is not waiting for the administration to act. But it absolutely is intended to be partnered with—and, again, it’s not—it’s not hard dollars. It’s not appropriated dollars. It’s an authorization for financing that would be, of course, expected to be paid back to the U.S. Treasury. MABRY: Let’s stay at the table. There are two more questions at the table. So the young lady here, and the young gentleman there. Q: Bhakti Mirchandani, FCLT Global, which is a think tank. Thank you for an enlightening discussion. Earlier this—or, actually last month, now, Italy became the first G-7 economy to sign up for the Belt and Road initiative. A number of European countries have signed up to varying degrees—Poland, Portugal. I’ve read op-eds about the U.K.—in the U.K. saying that the Belt and Road initiative could be good for the U.K. But how do you see this playing out in either larger economies joining, or in the European economies that have already signed up? MABRY: And, again, start off with a precis of Belt and Road, if you can. MURPHY: Sure. So—I mean, this is happening, right? China is going to have a much bigger footprint inside Europe. And we can talk as well about what to do in and around their own periphery. What I’m suggesting here is that the United States has got to recognize that what we have today with respect to international finance is not big enough and not good enough. The BUILD Act was an important step forward because it dramatically expands the amount of financing that the United States can do. Again, I would make the argument—and I have—that we should also be willing to put hard dollars in, not just the money that expect to be paid back, but actually put real dollars on the ground. It was referenced in my opening that I have actually proposed a very specific plan to double the size of the State Department and of U.S. aid abroad. A doubling of the State Department would go—and of USAID—hard dollars. It would go from $50 billion, roughly the size of those budgets today, to $100 billion. Fifty billion dollars is the one-year increase that we gave the Department of Defense last year. (Laughs.) So as much as it sounds enormous to double the size of U.S. development authorities, the amount of money I’m proposing is the amount of money that we will probably give the Defense Department in a one-year increase this year, as we did last year. In and around Asia, and I won’t go too deep into this, Democrats need to find a way to be for the Trans-Pacific Partnership. Trans-Pacific Partnership is the most important political tool that we have at our disposal. Again, you are never going to displace China in the region, but you can at least make the United States—and economic relationship with the United States an easy second choice, an easy fallback option. And so I think one of the most important projects for the Democratic Party in the next year and a half is to come up with an outline of at Trans-Pacific Partnership that we could be for, right, to give a template to the new Democratic president as to how to even get something through the Congress, after we obviously renegotiate it. But I think that is—that is the most important project outside of Europe, is to find some bipartisan consensus there. MABRY: Let’s finish off the table there, and then we’ll bounce back here to this side. Q: Hi. Shawn Golhar with Barclays. Can we talk a little bit about tariffs? So the president’s rumored to put forward Section 232 tariffs on European auto and auto parts. Obviously in light of all the other negotiations with 5G and the other tension there, can you comment on how Congress would respond, particularly from the Republican side, if President Trump puts forward those tariffs? MURPHY: I mean, Republicans talk a big game on tariffs, then they do nothing about it. I mean, this is—the way in which the president has used the national security tariff, the exception to impose tariffs for national security reasons, simply does not square with the statute, simply does not square with the intention of Congress. And Republicans will sort of gleefully tell you that, both publicly and privately. But then they are not willing to do anything about it. Congress clearly has the ability to withdraw that power from the president, to either eliminate the ability of the president to use that that statue in order to enact what are clearly economically based and rationalized tariffs, or to greatly limit it. Bob Corker was the sort of chief backer of proposals to limit or eliminate that tariff ability. He’s gone. And no one has really stepped up in the Senate Republican Caucus in his stead. The House may act, but right now it doesn’t seem as if Senator McConnell has a lot of interest in stepping up and actually passing something that would limit the president’s authority. And without that significant Republican pushback, the president is going to continue to at least threaten to expand the use of that section. Which is really terrible news for Congress in the long run because it sets a precedent by which Democratic presidents and future Republican presidents will follow. It used to be that Congress passed tariff laws, right? The most famous ones you know about, passed by Congress. That’s not how it works any longer, and we may never get back that prerogative if we give it up for the rest of the Trump presidency. MABRY: Right here in the front. Q: Hi. Amy Sorkin, the New Yorker. Just thinking about your story about Serbia and Albania, and what you could only describe as British befuddlement about the seriousness of the Irish border issue, do you think that the U.K. miscalculated EU membership was to Ireland, and how important Ireland is to the EU? MURPHY: I think that’s probably right. I mean, it’s been miraculous how little discussion there was about the implications for Ireland and Northern Ireland at the time of the referendum. I mean, almost no serious talk, even in Northern Ireland, about the fact that there would, you know, ultimately have to a choice made between a real departure from Europe or a border. Northern Ireland voted against Brexit, but it wasn’t overwhelmingly so. It was sort of 55-45. And the reasons for that are obvious. The, you know, unionists, you know, who have that—a deeper sense of British nationalism than those who, you know, live on mainland Britain do, got swept up in this narrative about reclaiming national greatness from Europe. And, you know, now, you know, some of the most hardened unionist farmers in Northern Ireland know that they made a big—a big mistake. I think you’re also right that, you know, Europe and Dublin have just gotten more important to each other since the Brexit referendum, especially as these technology companies choose Dublin as home, and as lots of companies started to move from London to Dublin. All of a sudden Europe saw Dublin as a potential—you know, along with Frankfurt—tech and financial services capital of the continent. But, again, I just don’t know that there’s any way to square this. And, unfortunately, the burden ultimately will be on Dublin itself. You know, Italians are not going to come to Ireland to put up the border. It’s going to be the Irish that are going to be required to do it. It won’t happen immediately, but if there is a hard Brexit at some point the smuggling back and forth will become so serious that you will have to put up some kind of hard infrastructure there. And given how fragile that peace is, that hard infrastructure—even if it’s just cameras—will become militarized very, very quickly. And this is exactly the wrong time for there to be any reason to create targets from sort of ethnic flareups, without devolved government—without a unified government in Belfast. There’s no—there’s no other places for some of those tensions to play out, other than the street. MABRY: Let’s stay at the table. Q: Valerie, Rockefeller Brothers Fund. Will you please comment on Afghanistan, specifically the peace process? Thank you. MURPHY: Yeah. So I have not been as critical of the administration on the way in which they are approaching the peace process as I am on their, you know, conduct towards Brexit and Europe. I understand and have met very recently with the representatives of the Afghan government who are understandably very upset at being sidelined in the discussions between the United States, NATO, and the Taliban. I understand that any commitments the Taliban make, you know, are probably only as good as my arm is long. At the same time, enough is enough. There is just not support in the United States for another twenty years of U.S. occupation of that country. We have to have circumstances and conditions upon which we can bring the vast majority of our troops home. And I think we are at a point in which we have to take a chance on commitments that the Taliban will make regarding who they would let in and not let into the areas of the country that they would control. And then we’ve got to work really hard with the Afghan government to try to come to some political understanding with the Taliban. None of that is easy, but I have supported the administration in its discussions. I have supported the administration in the decision to sequence the discussions. And I think we all keep our fingers crossed. It’s the only game in town, and probably the best chance to be able to bring a sizable number of our folks home. MABRY: Let’s get two more questions. Right here in the front, and then second right in the middle. OK? Thank you. Yep. It’s coming. It’s coming. There you are. Thank you. I’d like to have you talk about the Congress and correct my misunderstanding. The House Democratic majority can pass whatever they want. They’ll never have enough votes peeled off from the Republicans to overcome any kind of a veto. So it’s a lot of noise. In the Senate, McConnell won’t even bring up for a vote anything that the president doesn’t want. You’ll have a few things where senatorial privilege, you’ll give a few guys to join the Democrats. You’re never going to get enough Republicans peeling off. So for two years, it will be absolutely the same. In other words, the Congress will—cannot accomplish anything. The president will continue to do whatever he wants because neither the House nor the Senate will be effective against the Trump White House. And in his second term, presumably, it will be the same. Do you share my view? MURPHY: Well—(laughter)—I mean, you have—you have accurately represented the state of politics in Washington and the consequences of split government. You know, that being said, there are—there are ways around that gridlock. And that predominantly happens when must-pass legislation is presented to Congress. And so the reason that we have the Global Engagement Center, despite the fact that the Trump administration did not want it, right? As I mentioned, they refused to accept the money for this new anti-propaganda outfit that we set up, is because we put it in the Defense Authorization bill. So we put the new office and the transfer authority from the Department of Defense in the Defense Authorization Bill. And the president wasn’t about to—wasn’t about to veto that piece of legislation. In the budget that we just passed, tucked inside it is a provision that removes Saudi Arabia from the list of preferred nations. I won’t go into the details of it, but there’s a list that you get on that qualifies you for discounts from the United States when you buy military equipment. That was withdrawn from Saudi Arabia. It didn’t get much coverage at all, but it was tucked inside of a bigger budget bill. And it was an important signal that Congress was willing to take some steps to reset that relationship—a topic that I’ve talked about at CFR before. So you’ve got to find the right moment, and the right piece of legislation. But on foreign policy, you can make some readjustments if you find something that the president has to sign. But you’re right, other than, we’re in between a rock and a hard place. I have been the leading proponent of getting the United States out of the war in Yemen. We finally got enough Republicans to support a resolution pulling us out of that war to get it passed by the Senate and the House. The president will veto it. We will not be able to overturn that veto and the war in Yemen with U.S. participation will go on. So that’s an example of a place in which we couldn’t get a policy change across the finish line, even though we had Republican support for it in Congress. MURPHY: Thank you, man. I appreciate it.